Spicer resigned from his post as press secretary Friday. On the day after the six-month mark of the Trump administration, Sean Spicer resigned from his post as White House press secretary. His resignation, confirmed by ABC News, came shortly after it was reported that Anthony Scaramucci, a Wall Street financier, was named as the new White House communications director. Spicer will continue his role through August, he tweeted shortly after the announcement. Spicer’s tenure in the White House propelled him to familiarity, beginning with his first opportunity to address the media on Jan. 21, in which Spicer lambasted news organizations for using images "intentionally framed" to diminish the size of the inauguration audience. But Spicer had a full career before he set foot in the White House press room. A native of Barrington, Rhode Island, he graduated from a Roman Catholic boarding and day school in 1989, reported the Newport Daily News. He went on to attend Connecticut College, where he graduated in the class of '93. He later joined the Navy in 1999. He still serves with the Navy Reserve, within the Joint Staff’s naval reserve contingent in Washington, D.C., and he fulfilled his duties most recently in April at the Pentagon, The Associated Press reported. He holds a master's degree from the U.S. Naval War College in Newport, Rhode Island. He was first brought onto Trump’s team during the transition as a spokesperson. In December, Spicer was given the job of press secretary. He previously served for six years as the communications director for the Republican National Committee and took on the role of chief strategist in 2015. While there, he worked with Reince Priebus, who went on to become Trump's chief of staff. According to the official bio for Sean Spicer on the GOP website, Spicer also served two years as assistant U.S. trade representative for media and public affairs in President George W. Bush's administration. The GOP bio details Spicer's other "distinctions" as "serving as an Easter Bunny at the White House Easter Egg Roll, being lampooned by the Onion, cited as a 'Moment of Zen' on 'The Daily Show,' and being mocked by David Letterman." 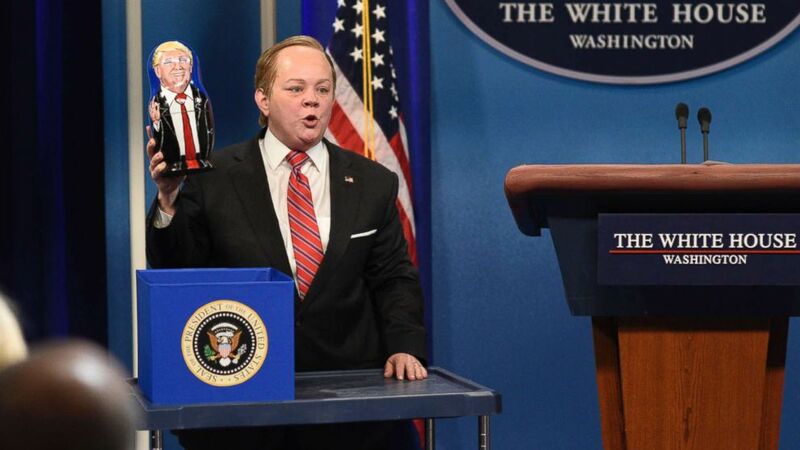 This shout-out doesn’t mention Melissa McCarthy's infamous portrayal of Spicer on "Saturday Night Live," which included her using stuffed animals to spell out the facts for reporters and cruising around New York City on a motorized lectern. Spicer took the lectern less often in recent months and began delegating duties to principal deputy press secretary Sarah Huckabee Sanders when former White House communications director Mike Dubke resigned in early June. Spicer’s last briefing, which was off camera, came on the Monday before his resignation. It was his first such briefing in three weeks.